Parents in HCMC are desperately trying to get a 'kindergarten graduate certificate' as rumours circulate that their children will not be allowed to enter first grade at infant without it. Minh, a parent in Binh Hung Hoa A Ward said, "I asked the headmaster at our local school and they said a certificate was required. 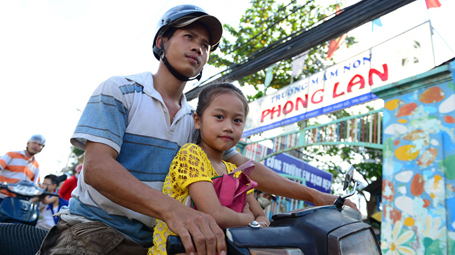 Now we have to register our child at a public school in two months with a tuition fee of VND1.8 million (USD86)." In Go Vap District, the story is even stranger. A parent said, "My family is poor so we don't want to enrol our child at a kindergarten. But our ward officers said that we needed the receipt to prove that our child had gone to kindergarten, even for just a month is good enough. So we spent VND900,000 (USD43) for one month at a private school. If it's not enough, we just have to wait to enrol next year." In early June, parents in Tan Binh District’s Ward 4 were also worried when the officers said only kids who went to kindergarten for at least two months could enrol into the local primary school. But both of the local kindergarten and primary school denied the information. Phong Lan Kindergarten in Binh Tan District is the only school which can provide the certificate, and it is receiving a large number of children. "Most of parents worry that their kids won’t be accepted if they don't have the certificate." a teacher at Phong Lan School said. "Parents should ask the primary school officer to make sure such a certificate is necessary." Some rumours said that although private kindergartens can’t provide the certificate, they could be bought at VND2-3 million (USD96-143). HCMC is one of ten cities implementing a project to universalise kindergarten education by the end of 2012. The false rumour was believed to have started because of various programmes such as the "Intensive kindergarten class" programme that was being implemented. This included local officials doing door to door visits to introduce kindergarten schools. An officer in Go Vap Ward complained, "The children are losing the chance to play and prepare for their first grade at infant school. Parents are forcing kids to do maths and read and write but aren’t letting them enrol at kindergarten. We have no other way other than resorting to threats." The local Department of Education and Training confirmed that a certificate is not required. However they also said parent should submit any certificate they have because specific cases would be dealt with differently.